Cruise Fever’s mission is simple, to help you have the best cruise possible. While we often write articles on things you should do on cruises, here are the worst mistakes that you can make on a cruise. 1. Climbing/horseplay on railings – Although this should be a no-brainer, we occasionally hear accounts of passengers sitting on the ship’s railings or climbing over balcony partitions. 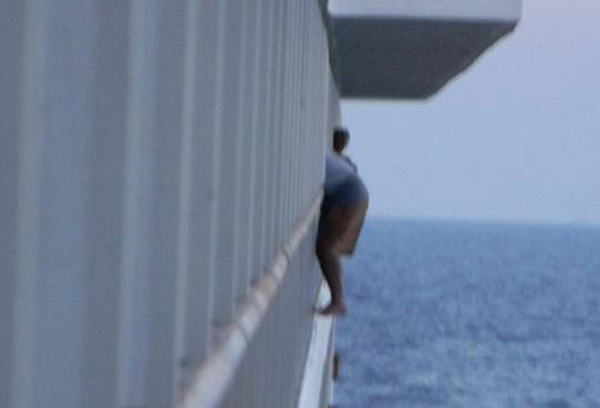 This is a photo sent to us of a cruise passenger who left common sense at home. 3. Getting too drunk – No one enjoys having an obnoxious drunk by them on the lido deck or at their dinner table. 6. Eating only at the buffet – While newer ships like Regal Princess have great buffets, the best food on a cruise is almost always in the main dining room. By eating only at the buffet, you miss out on the great food and service that is offered in the main dining rooms and specialty restaurants. 7. Line cutting – We all hate waiting in lines while on vacation, but it’s part of life. 8. Booking late flights on embarkation day – Booking late flights on embarkation day is a great way to miss your cruise. While it is not always possible for everyone to fly in the day before due to work commitments, you should always plan on arriving the day before if you are able to. 9. Booking early flights on disembarkation day – Cruise lines recommend not booking flights before noon on disembarkation day. Just because your arrival time says 7:00 a.m., there is almost no chance of catching an 8:30 flight. There have been times I walked right through customs, and other times it took over an hour to get through the line. 14. Treating the crew like 2nd class citizens – We all have bad days, but how many you would have if you worked 7 days a week and were away from your family for 6-9 months at a time? Kind words to the crew will go a long way, treat them with the same respect that you give to your spouse. 16. Lying on your medical form – Before you board your cruise, you have to fill out a medical form where you check boxes of certain symptoms that you have had over the past 48-72 hours. Lying on this form is a great way of spreading an illness to other passengers. Lying on your form is one of the biggest mistakes you can make on a cruise.